Welcome to the Thursday Skunk of the Week, in which I spray my stink on an unsuspecting team that probably felt great about their chances until I became involved. In Week 1, I sprayed the Giants by comparing Jerry Jones’s last 15 years to my dog crapping all over my house on Labor Day. You might remember Tony Romo subsequently picking the Giants apart en route to an opening-night upset. In Week 2, I sprayed the Bears by raving about Brandon Marshall’s impact on their franchise — not just this season, but historically, as their first great receiver maybe ever. Marshall disappeared that night in Green Bay, catching just two passes and dropping a wide-open touchdown in a Packers blowout. Tonight, Carolina is giving 2.5 points at home against the banged-up Giants. 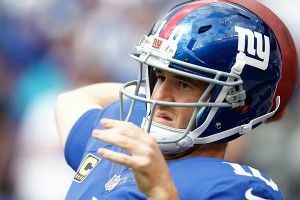 I thought this was an easy pick: The Giants look like a mess defensively; they can’t run the ball; they’re missing a bunch of guys (including Ahmad Bradshaw and Hakeem Nicks); they’re playing on the road with just four days of rest; they have to deal with Cam Newton doing Cam Newton things for four quarters; and their coach’s head is still shaded dark-maroon thanks to Greg Schiano. For the life of me, I can’t figure out why anyone would take the Giants getting less than three tonight. And that’s before we get to this e-mail from Matt V. in East Northport, New York. and on the other sideline, we have a decent Panthers team with a sneaky-good running game and Cam Newton in “I can’t wait to impress a national TV audience!” mode? And I’m giving less than three points? Carolina, you’ve just been sprayed.